VARENNES, Quebec — Sales gains in the front end helped lift revenue for the Jean Coutu Group retail store network in the company’s fiscal 2017 first quarter. Jean Coutu said Tuesday that for the first quarter ended May 28, sales for its franchise store network edged up 1.5% to nearly $1.079 billion (Canadian) from about $1.063 billion a year earlier. Revenue was up 3% in the front end and 0.8% in the pharmacy. Same-store sales rose 1.1% in the quarter, reflecting gains of 2.3% in the front end and 0.5% in the pharmacy. Sales of nonprescription drugs, which represented 9% of total retail sales, climbed by 3.9%, compared with 4.4% a year ago. Prescription count grew by 4% overall in the first quarter and by 3.8% on a same-store basis. Jean Coutu said generic drugs accounted for 70.7% of prescriptions in the quarter versus 69.1% in the prior-year period, which had a deflationary impact on pharmacy retail sales. For the 2017 first quarter, introductions of new generics and price reductions for generic medications each pared retail pharmacy sales growth by 0.2%, Jean Coutu noted. In addition, the company said, periodic deductions agreed on between the Ministère de la Santé et des Services Sociaux (MSSS) and the Association Québécoise des Pharmaciens Propriétaires (AQPP) cut the growth of those Rx sales by another 1.3%. 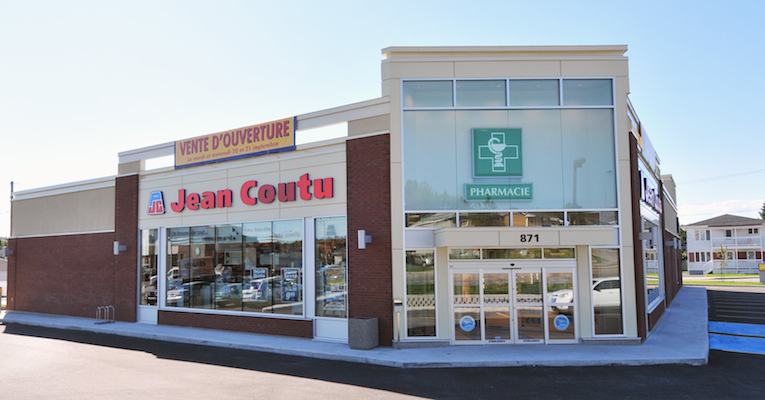 Jean Coutu’s franchise network opened five new stores, including two relocations, and remodeled or expanded four stores during the first quarter. As of May 28, the network encompassed 420 stores in Quebec, New Brunswick and Ontario under the PJC Jean Coutu, PJC Clinique, PJC Santé and PJC Santé Beauté banners. On the corporate side, Jean Coutu Group reported revenue of $723.6 million in the 2017 first quarter, up 1.6% from $712.4 million a year earlier. The company attributed the sales gain to overall market growth and the expansion of the franchise store network. Jean Coutu’s income consists of sales plus other revenue from franchising activities in Canada, with merchandise sales to franchisees through its distribution centers representing most of the company’s sales. Net earnings for the first quarter came in a $49 million, or 27 cents per share, compared with $50.6 million, or 27 cents per share, a year ago. Analysts, on average, had forecast earnings per share at 29 cents, according to Zacks Investment Research. Jean Coutu said that during the 13-week period ended May 30, 2015, a tax provision of $4.7 million was recorded after a judgment rendered by the Quebec Court of Appeal. An appeal hearing at the Supreme Court of Canada was held on May 18, 2016, and a decision is pending, the company reported. Operating income before amortization (OIBA) in the 2017 first quarter fell to $77 million from $83 million in the year-ago period. Gross sales at Pro Doc Ltd., Jean Coutu Group’s generic drug business unit, rose to $51.5 million in the 2017 quarter from $50.3 million a year earlier.